WOW!!! amazing! Thank you for sharing!! Well captured! What a daredevil! On a cold afternoon on the Virginia side of Great Falls, we were entertained by about a dozen kayakers. Although this guy did not, most of them had GoPros mounted on their helmets. What a great show! This photo was taken at Great Falls Park, VA. The Potomac river rages here through a series of steep and jagged rocks. My friend and I were at a conference in the area and he was anxious to take me to this park to shoot the waterfalls. It was a cold and blustery November afternoon, so we bundled up and headed out for the last few hours of daylight. 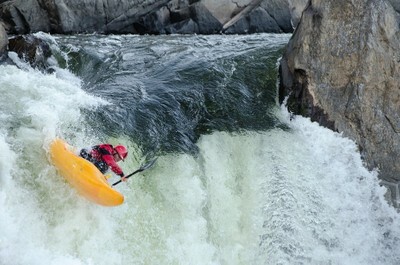 Much to our surprise, we found about a dozen extreme kayakers doing what they love. The sun was still shinning, but this section of the falls was in the shade. I wanted to stop the action, so I opened my aperture to 3.5 and bumped my ISO up to 800. In retrospect, I should have bumped the ISO some more, but that's why I keep shooting. I learn something every time I take my camera out. This was shot with a Nikon D7000 and a 70-200mm lens at 200mm. Although I had my tripod with me, I don't believe that I used it for this shot. My friend and I climbed on the rocks (beyond the boundary, shame on us) to get a better angle on this particular fall. Thinking that I was going out to shoot long exposure waterfalls, ... you know, the typical waterfall shot that we all love ... I couldn't help but get excited to capture some of the real action of these kayakers. They really helped to give the falls some scale and to show the power of the water. After having this experience, I am stoked to seek out some more action photography opportunities. I mostly use Lightroom for my basic color temperature and exposure corrections. Then I may use Photoshop to do some more sharpening or detail extraction. For this photo, I increased the saturation of the reds and yellows a bit to help the kayaker pop a little. Other than that, I did not do very much at all. I never leave home without my 70-200mm lens. I usually have my 24-70mm along with me for those landscape shots, but I always find that I like my images better when my subject is closer and more personal, so I wind up reaching for the longer lens. Beyond these lenses, I also carry a 1.7TC, a few filters, spare batteries/memory cards, and a cleaning cloth. I think the hardest thing to get right on a shot like this is sufficient depth of field (this is rather shallow and I would have liked some more) while also freezing the action. What I have heard many time since I took this shot is ... don't be afraid to bump the ISO! Extra grain in your image is worth it if you can capture the shot you are looking for.